As technology becomes smaller, faster and more powerful, thermal management is becoming and increasingly crucial part of any product’s design. Afterall, higher device performance often comes at the price of reliability and lifetime if thermal factors are not given due consideration. This trend for all things small continues to the boards that devices are mounted on, with units being placed closer and closer together into smaller spaces to decrease system size and cost and improve electrical performance. Yet, from a thermal management perspective, increased power and smaller sizes are a bad combination. 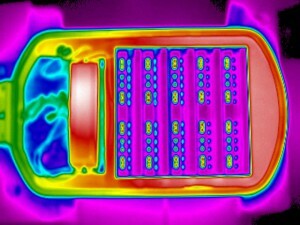 This increased ‘power density’ is the driving force behind a heightened focus on thermal management across many industries. To assist board and system level designers in their quest to create more intricate products, iLumTech can provide a wide range of thermal characterisation services to customers. 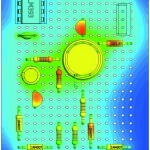 The cost effective design of an electronic system requires careful consideration of thermal management. The over-design of an electronic system adds unnecessary cost and weight, whereas the under-design of a system may result in overheating and even system failure. Finding an optimised solution requires in-depth understanding of how to predict the operating temperature of a device and how the heat generated by the given components affects neighbouring components and devices. Thermal assessment requires a combination of analytical calculations using thermal specifications, empirical analysis and thermal modelling. 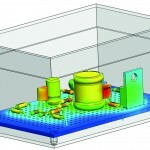 CAD-embedded thermal simulation enables the performance of thermal analysis at various stages of a product’s design process to ensure that all components and their assembly perform properly within the expected temperature ranges and highlights safety issues before they arise. Nothing is perfect, yet optimisation is the process by which we can get as close as possible. It is the act of trading off various potential solutions in order to arrive at the one that best meets the given product design objectives. 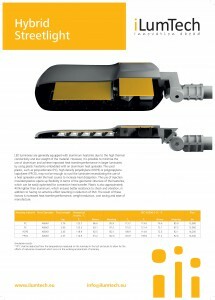 This ensures that products have the greatest performance possible while remaining lean and cost effective. Many materials experience changes in their thermo-mechanical properties during heating and cooling. Changes that affect the reliability of products. 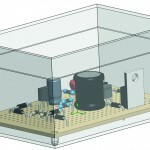 Thermomechanical simulation allows engineers to understand how the structure of a device behaves under both thermal and mechanical loading, enabling the prediction of structural reliability. 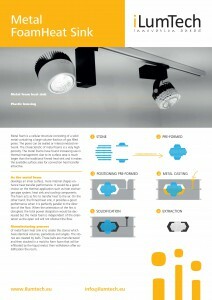 We evaluate each design from a thermal point of view, whether that be of a full luminaire or of just electronic, optical or mechanical designs and parts. We can offer assured results thanks to necessary close partnership with all other engineering departments. 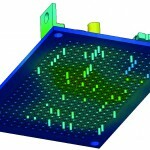 Advanced computer simulations allow us to analyse and understand the performance of structures and systems so that we can improve them. This requires the cooperation of engineers and designers throughout product development with the aim of providing useful and constructive feedback and ideas. 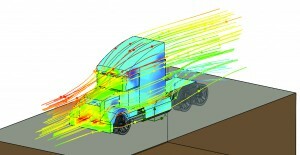 Thermal simulations are performed using SOLIDWORKS equipped with a wide range of additional modules. The basic steps involved in the thermomechanical lifetime assessment of components are fluid dynamic studies, transient thermal calculations and mechanical computations that identify loading conditions. Estimating the lifetime of thermomechanically loaded components is both time-consuming and expensive, therefore, the simulation of fatigue is a vital design step that minimises timescales and costs. Ventilation flow rate is an important parameter in the measurement of indoor air quality. It can affect respiratory diseases, Sick Building Syndrome symptoms, productivity and perceived air quality. The determination of ventilation flow rate is very complex as it is based on various difficult to quantify factors including outdoor air quality, airflow rate, indoor generation of pollutants, air moisture content, thermal environment and air supply. 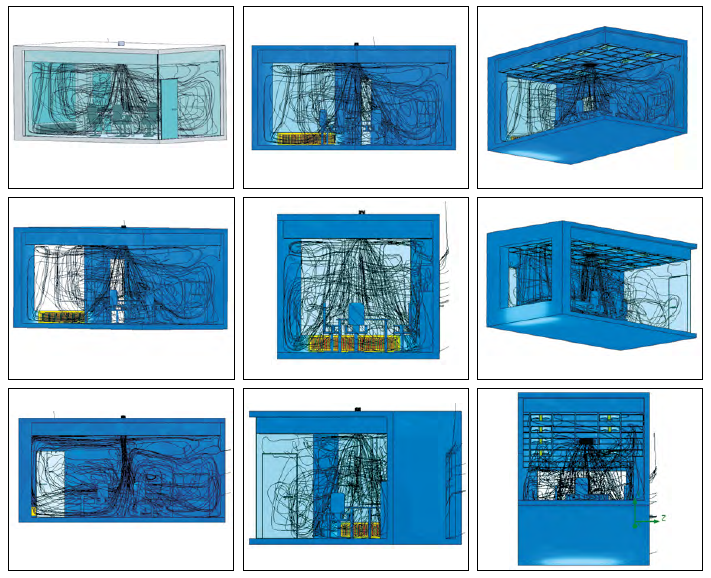 Only by including all these parameters in a simulation can an optimal indoor design be provided that ensures the thermal comfort of building users. 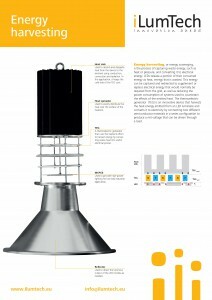 It is vital that living and working envi-ronments receive suitable ventilation forboth health and wellbeing. 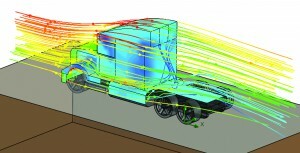 We use ad-vanced computer simulations of airﬂowthrough buildings, allowing us to deter-mine the most effective outcome. Interior environments must be kept at comfortable temperatures in order that occupants are both at ease, healthy, perform well and not detrimentally affected by excessive heat or cold. To achieve optimal temperature control it is necessary to take into account all heat sources, not only the obvious ones. This includes everything from the heating system itself, through lighting to appliances and technical devices. In some environments, the safeguarding of air quality is of crucial importance. 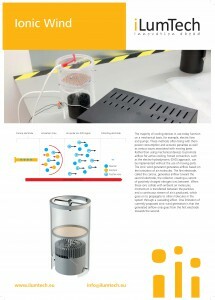 This involves both the prediction and optimisation of contaminant removal and circulation of air supplies. Strong winds such as experienced during heavy storms and hurricanes induce forces and pressured distributions on objects that can lead to safety issues and potentially dangerous conditions. To avoid disaster, force predictions for a product need to be incorporated into its design from a very early stage. To minimise and control the risk of dangerous conditions from exceptional air velocities, forces, pressures and accelerations, it is important to assess and understand the effects of such forces on all components and the assembly of a product.